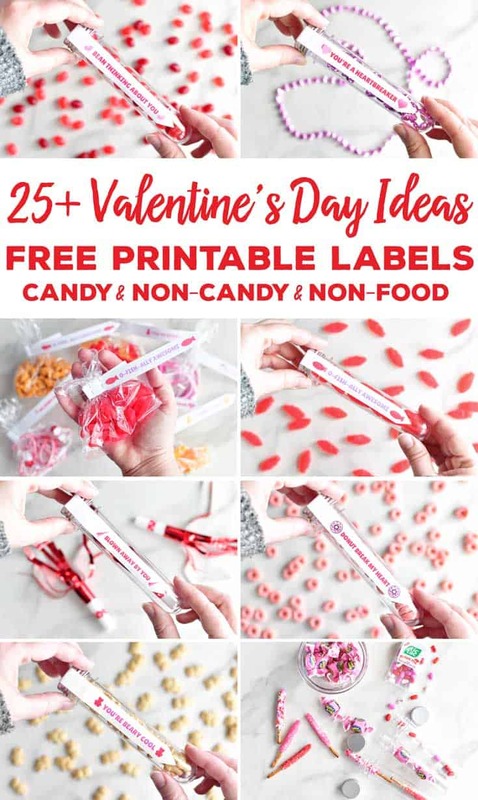 Here are 25+ Valentine’s Day Ideas with FREE printable Valentine’s Day Card test tube labels for the test tube Valentines or use them for Valentine’s Day treat bags including candy filled Valentines, non-candy Valentine’s Day ideas, and non-food Valentine’s Day Ideas. We are a family that loves puns and Dad Jokes. I guess I shouldn’t say my kids “love” them but they are very good at coming up with puns and there are times during long car rides when we pass the time buy coming up with as many puns on a certain topic. 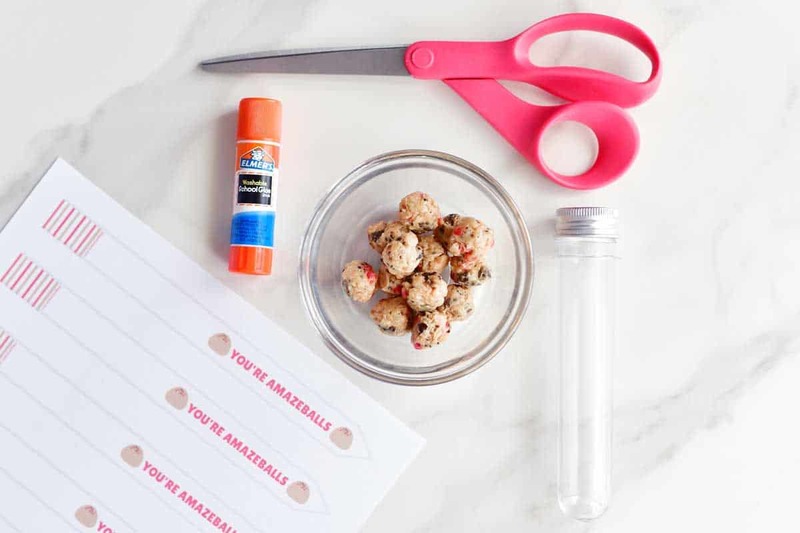 So, my family helped me brainstorm these fun Valentine’s Day Ideas and they are so easy to put together. Be sure to check out the answers to FAQ and helpful test tube label tips at the end of the blog post! 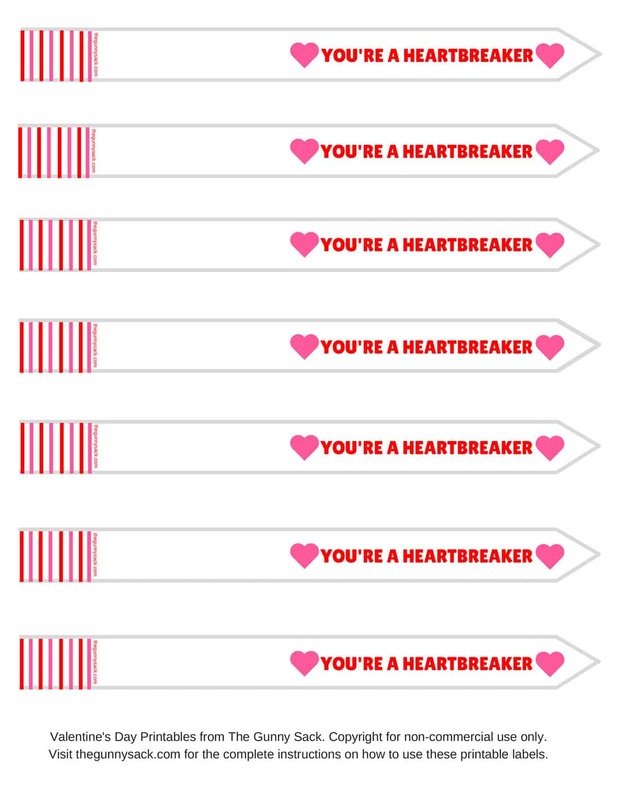 Disclaimer: This post contains links to the products I used to make these test tube Valentines. If you use those links, I may earn a commission. Learn more here. 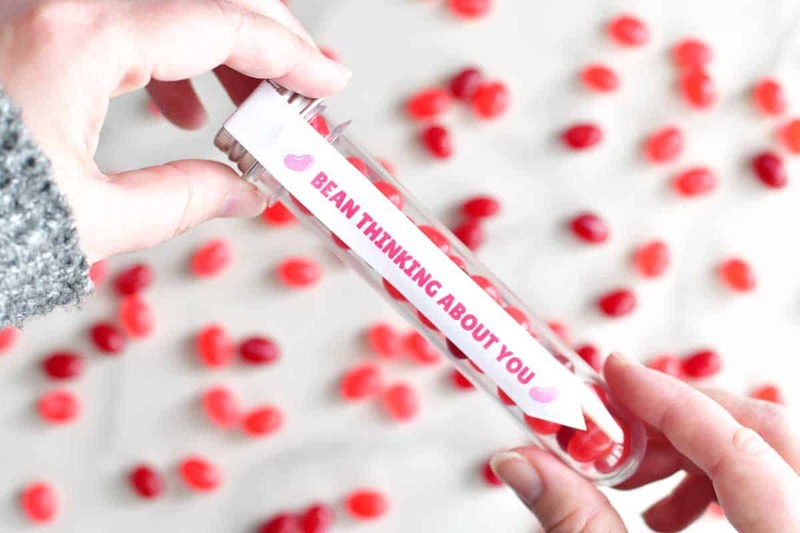 Bean Thinking About You: For this test tube, use red, pink, or white jelly beans. I used pink and red jelly beans Starburst Jelly Beans FaveRed because they sooo good and they are smaller in size. Download the Bean Thinking About You printable here. I Chews You: Fill the test tube with pink bubble gum. I used wrapped Hubba Bubba and they fit perfectly in the test tubes I bought. I couldn’t find gumballs at Target but later spotted some at Dollar Tree. Just make sure they are small enough to fit into your test tubes. Download the I Chews You printable here. 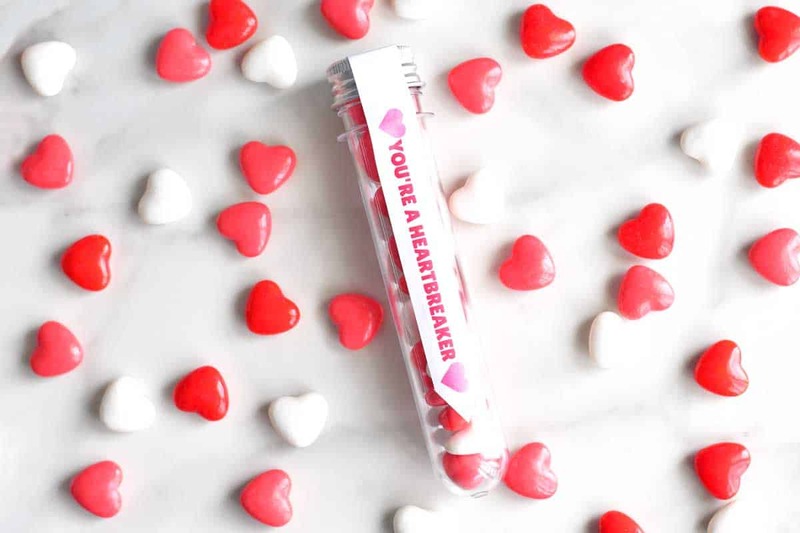 You Make My Heart Go Tic Tac: Use the Valentine’s Day Be Mine mix of pink, red, and white Tic Tacs to fill the test tube. One pack doesn’t quite fill it all the way to the top but that’s okay. If you can’t find the Valentine’s Day mix, try the pink Strawberry Fields Tic Tacs, the red Cherry Cola Tic Tacs, or the white Freshmint Tic Tacs. 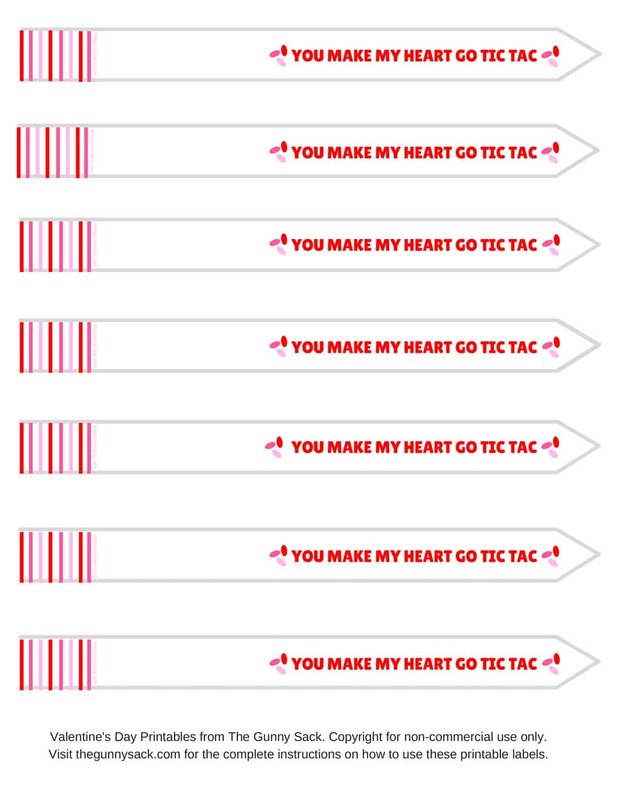 Download the You Make My Heart Go Tic Tac printable here. 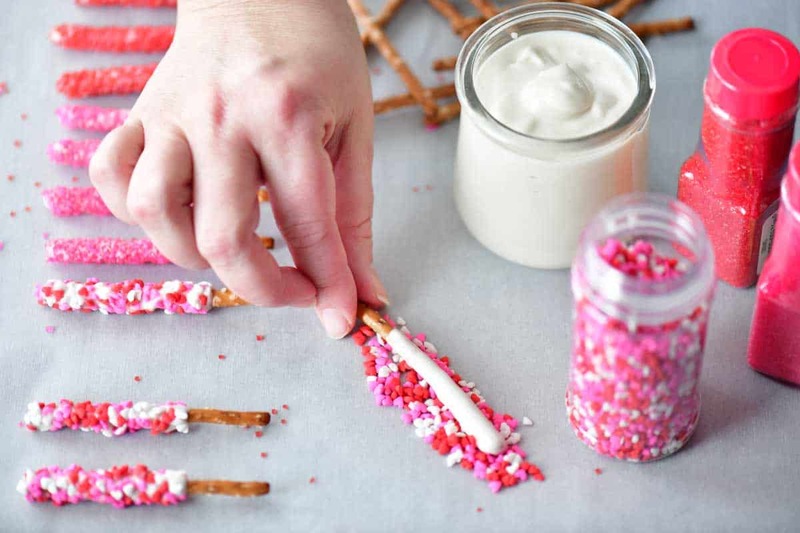 Let’s Stick Together: For this one make mini dipped pretzel sticks (↓ recipe below ↓). I was able to fit three pretzel sticks in the test tube but that will depend on how thick the white chocolate and sprinkles are on the pretzels. I used micro heart sprinkles and red and pink sanding sugar sprinkles for a variety but any of the red, pink, and white sprinkles and jimmies would look cute. Another option would be to use red or pink candy melts instead of white chocolate. Download the Let’s Stick Together printable here. Put the white chocolate chips and shortening in a microwave-safe bowl. Melt in the microwave at medium (50%) power for 30 seconds and then stir. Continue heating at medium power for 15-second intervals, stirring after each interval, until melted and smooth. 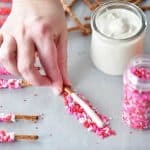 Dip the mini pretzel sticks into the melted white chocolate and allow the excess chocolate to drip off before coating it with sprinkles. You can shake the sprinkles on or gently roll the chocolate coated pretzel in sprinkles. Place on a piece of waxed paper, parchment paper, or a silicone baking mat to allow the white chocolate to harden. 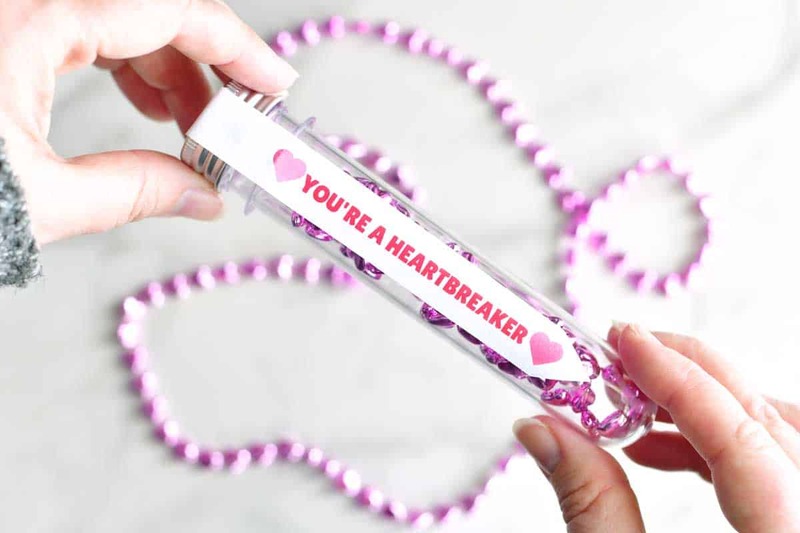 You’re A Heartbreaker: This test tube is filled with red, white, and pink Everlasting Gobstoppers Heartbreakers. 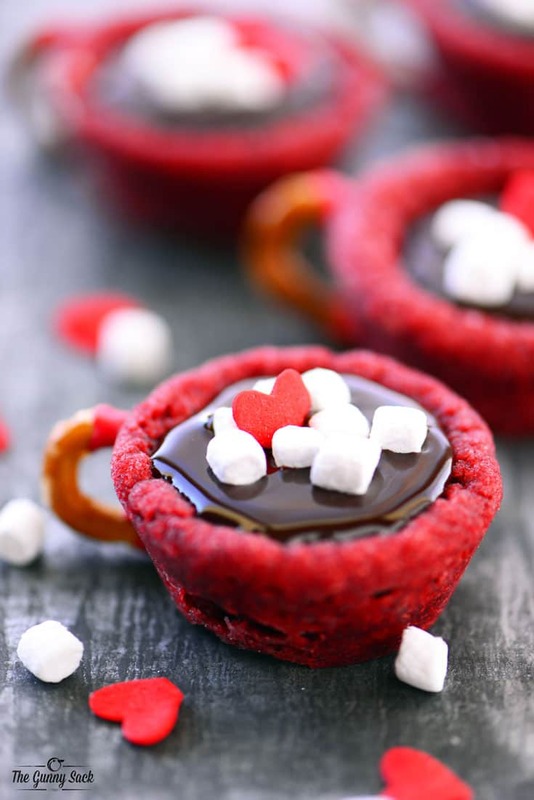 There are lots of heart-shaped Valentine’s Day candies out there and all of them would work for this one! 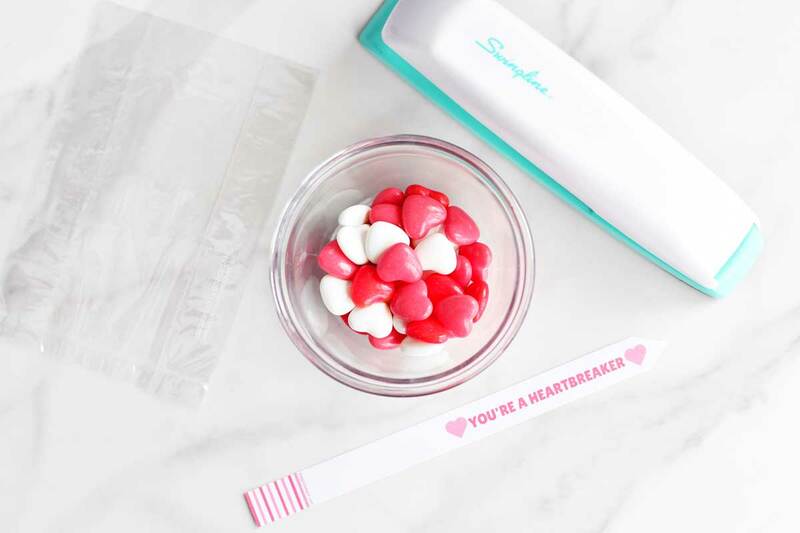 Download the You’re A Heartbreaker printables here. 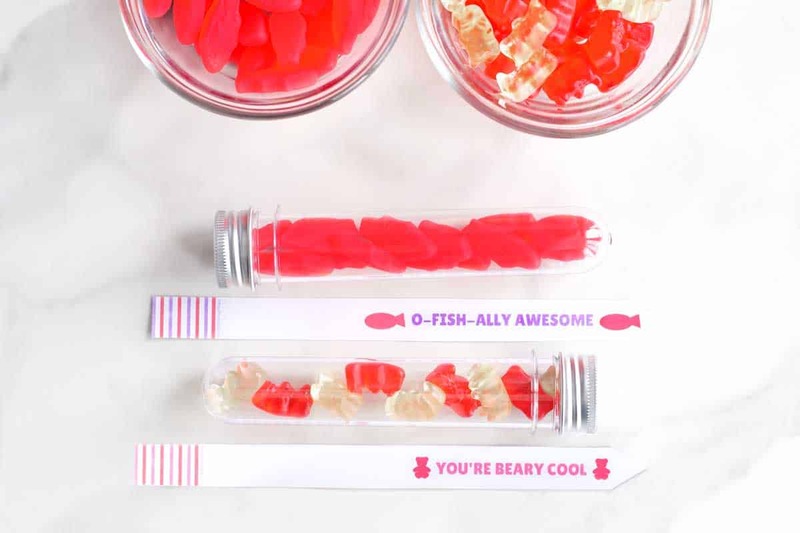 You’re Beary Cool: Buy your favorite gummy bears and fill the test tube. I used red and white but any color would work. 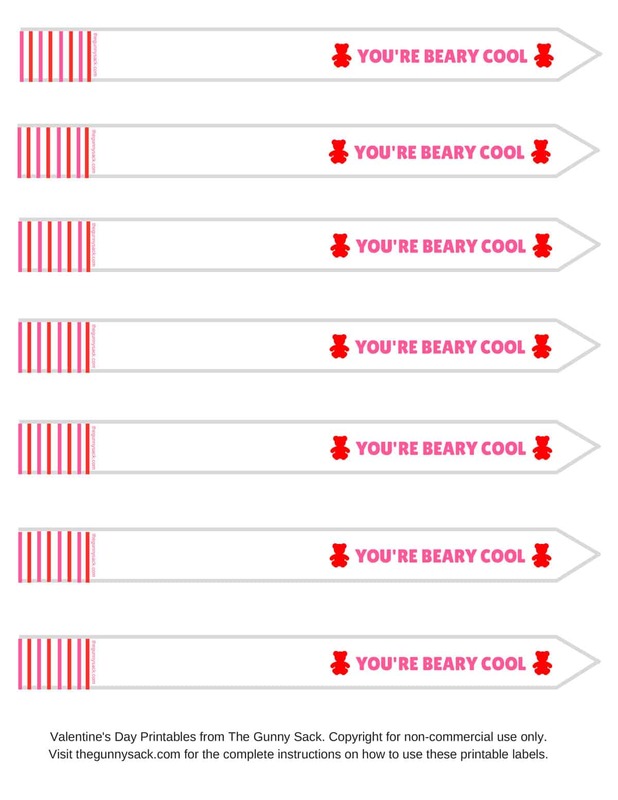 Download the You’re Beary Cool printables here. 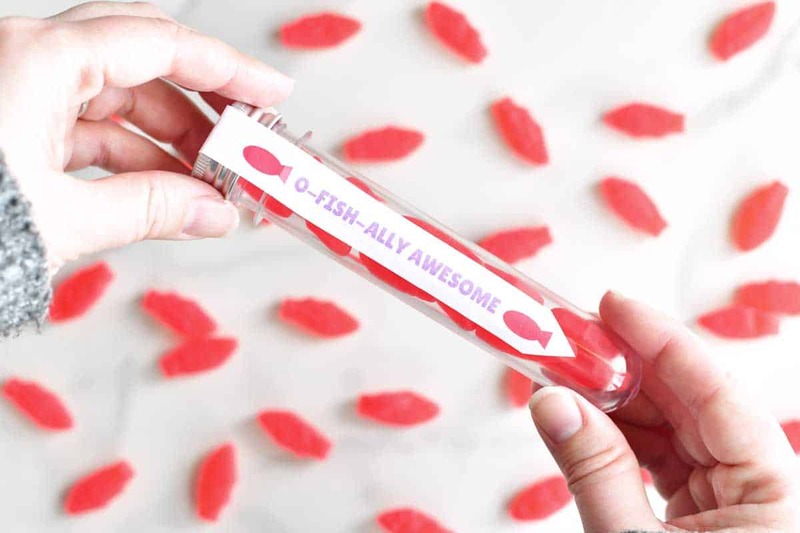 O-FISH-ally Awesome: I used the mini Swedish Fish for this test tube because they are so cute but the regular size Swedish Fish would work too. 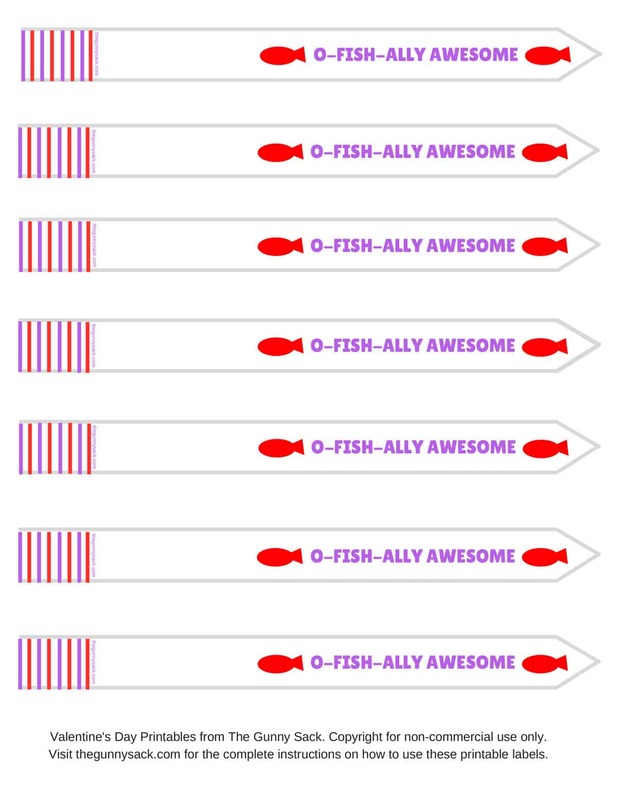 Download the O-FISH-Ally Awesome printables here. 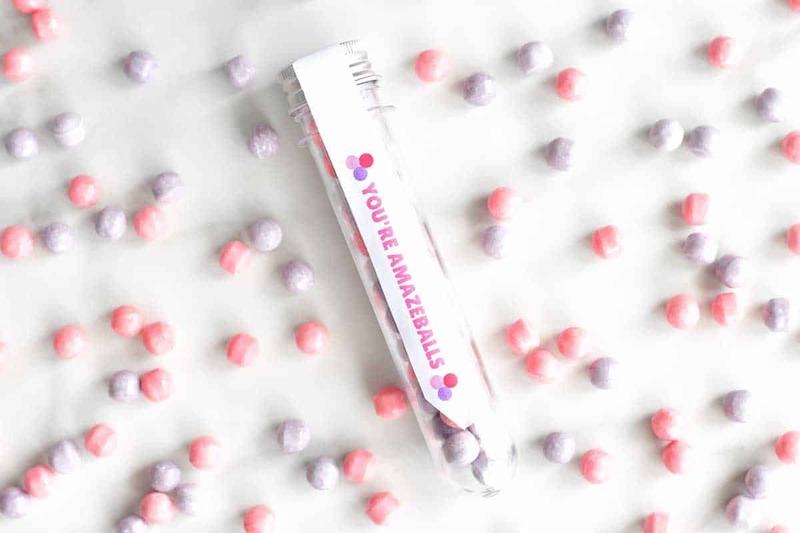 You’re Amazeballs: Any ball-shaped candy would work for this test tube. I used the mix of pink and purple Mini Chewy Sweetarts. You could also try pink and white Sixlets or small pink gumballs or even pink and red Skittles. 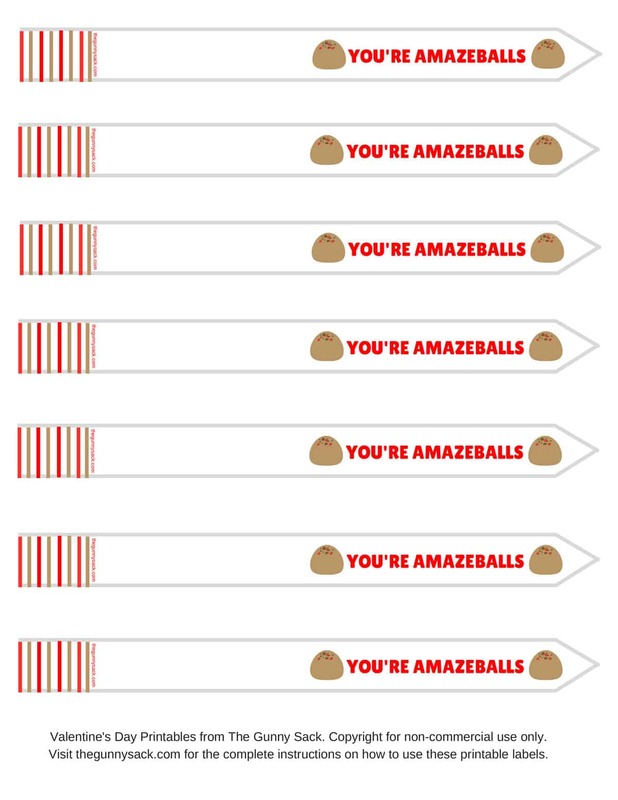 Download the You’re Amazeballs printables here. 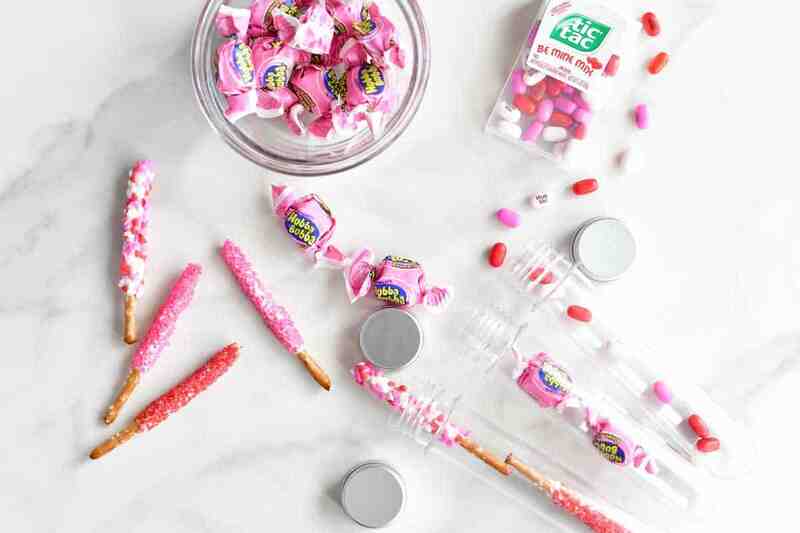 The next several Valentine’s Day test tubes are still filled with edible things just not candy. Sometimes kids get so much candy during that holidays that you are looking for alternatives or healthier ideas. 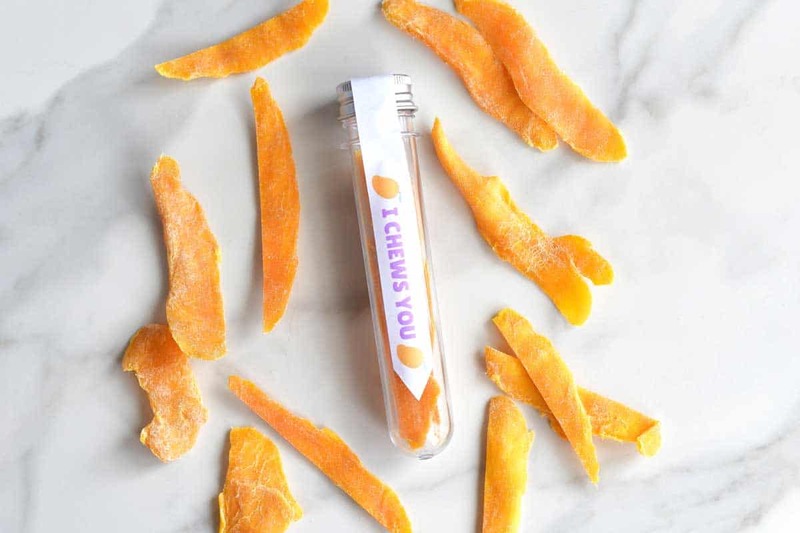 I Chews You: Fill the test tube with chewy dried fruit, fruit leather, or natural fruit snacks. I used dried mangos because my kids love them. 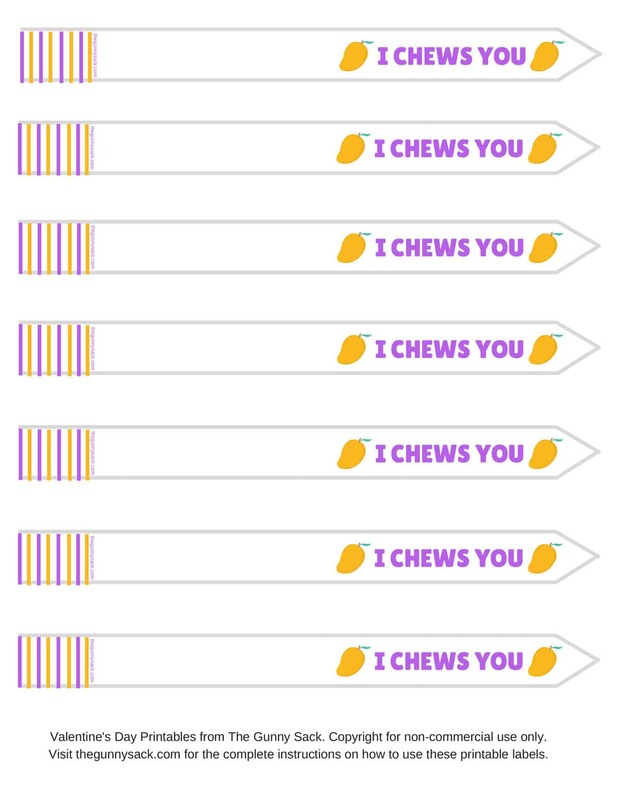 Download the I Chews You printables here. 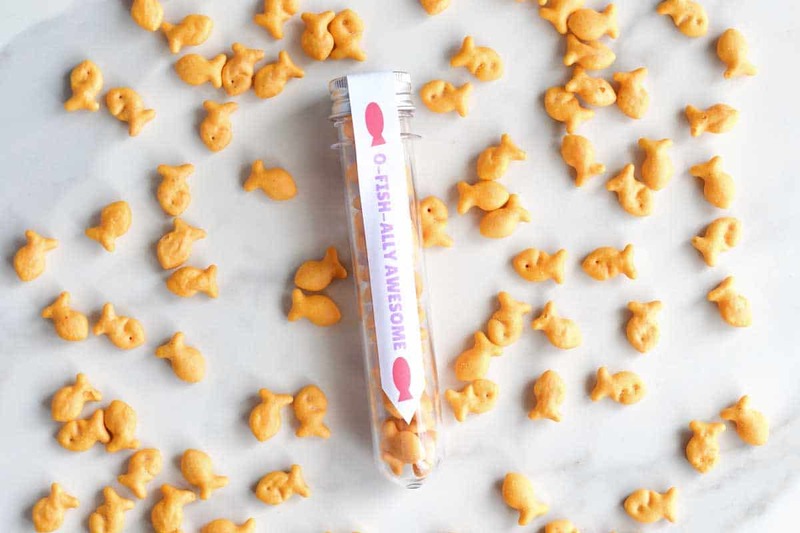 O-FISH-ally Awesome: All of those baby Goldfish look so cute swimming around in the test tube but the regular sized Goldfish will work too! 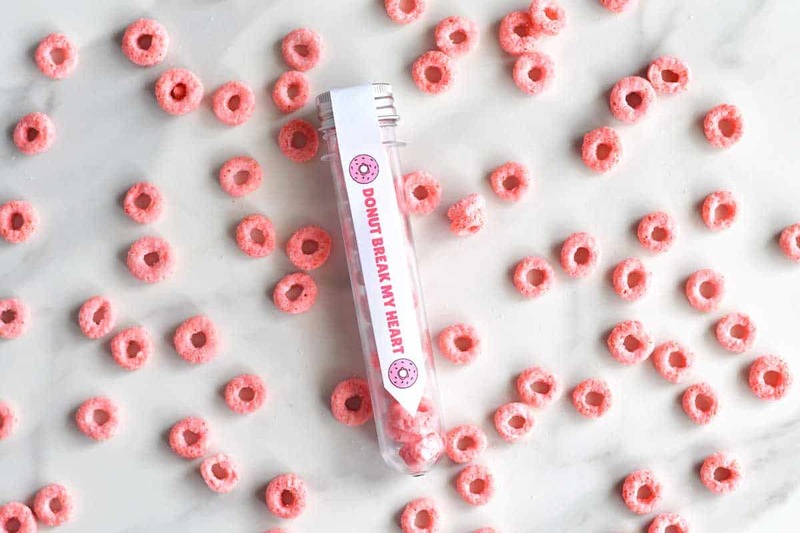 Donut Break My Heart: This test tube is filled with Kellogg’s Pink Donut Shop cereal because it’s pink and tastes great. Fruit Loops or Fruity Cheerios could also be used. 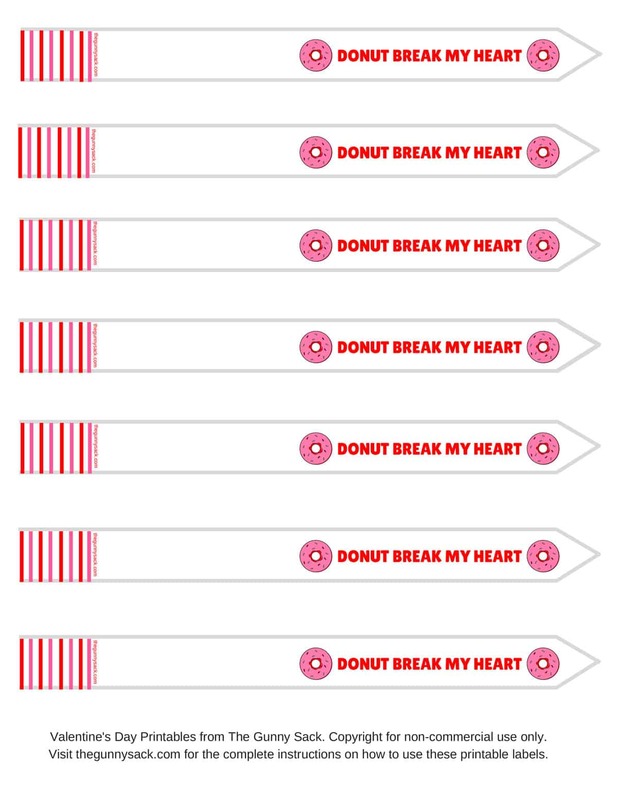 Download Donut Break My Heart printables here. 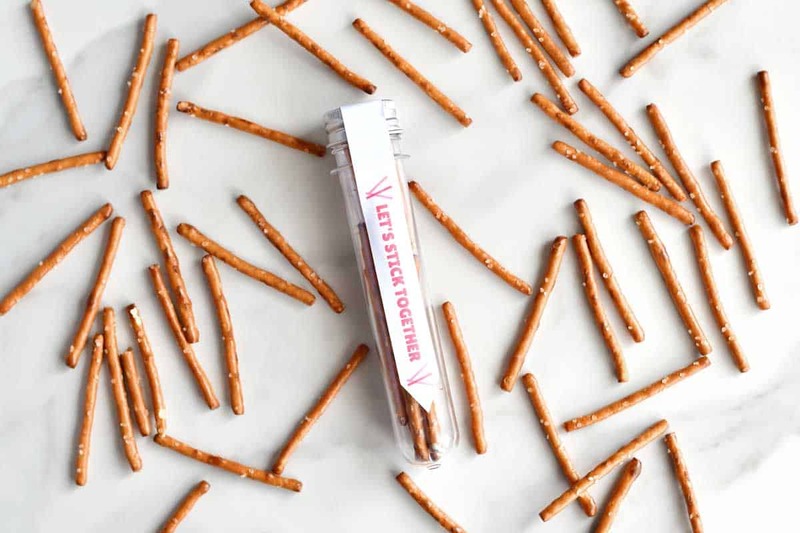 Let’s Stick Together: Pretzel sticks are an easy way to fill this test tube. Another idea would be beef sticks if you can find ones that are short enough to fit. 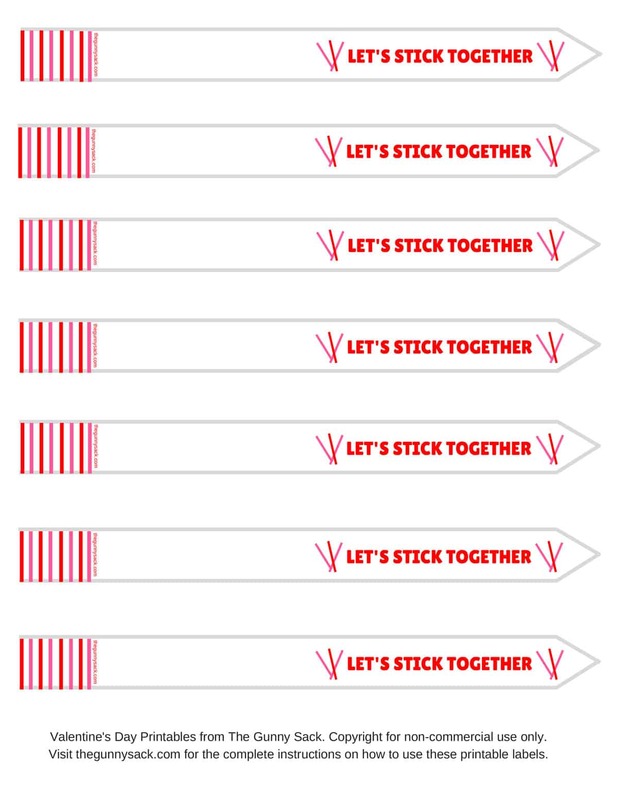 Download the Let’s Stick Together printables here. You’re Beary Cool: Again, I went small with the mini Teddy Grahams but the original Teddy Grahams will work too. Bean Thinking About You: These aren’t really beans but they look like them so that counts right? I used Sun Maid vanilla yogurt covered raisins. We tasted tested Good Sense Edamame (soybeans) because they got good reviews but my kids preferred the raisins. 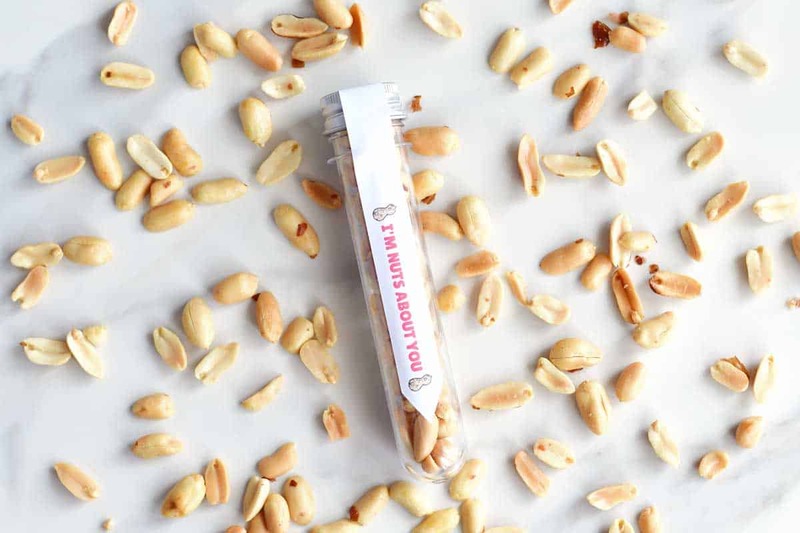 I’m Nuts About You: Fill the test tube with your favorite nuts. I used peanuts for this one but my kids like nuts of all kinds so any would work. 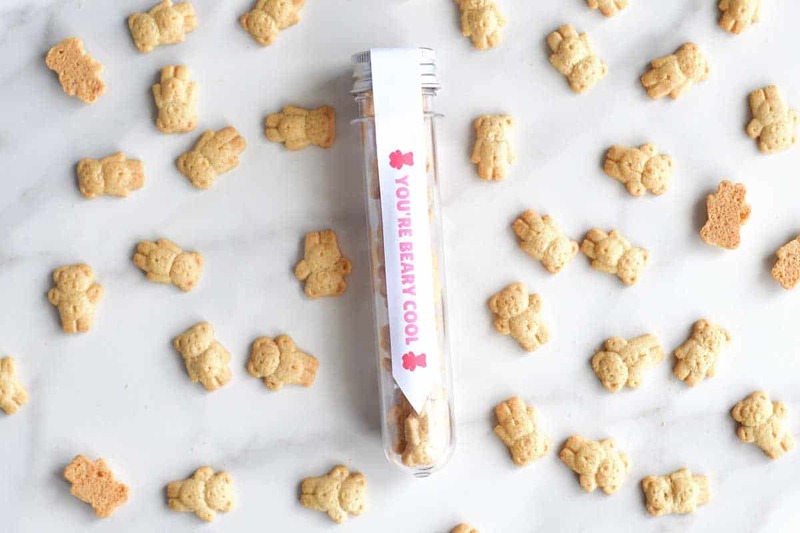 Please be aware of peanut allergies if giving these test tubes as gifts. 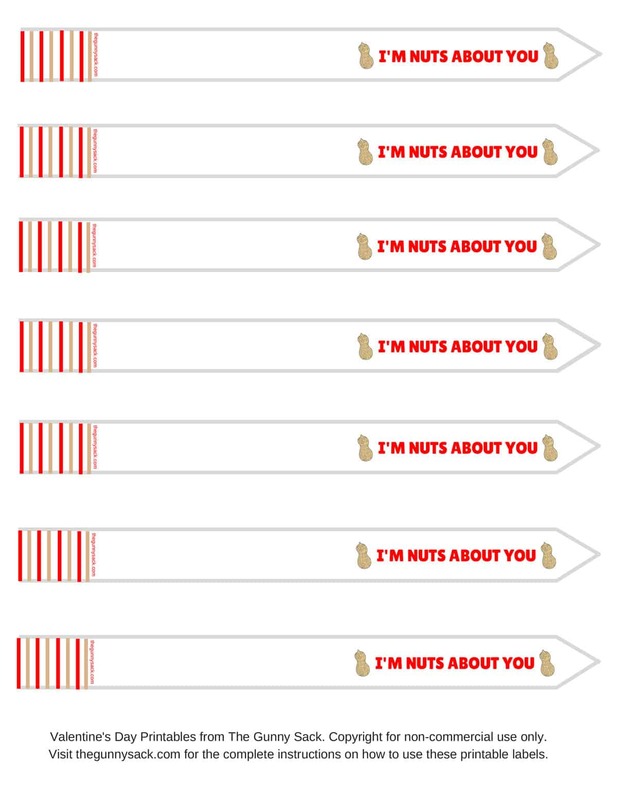 Download the I’m Nuts About You printables here. 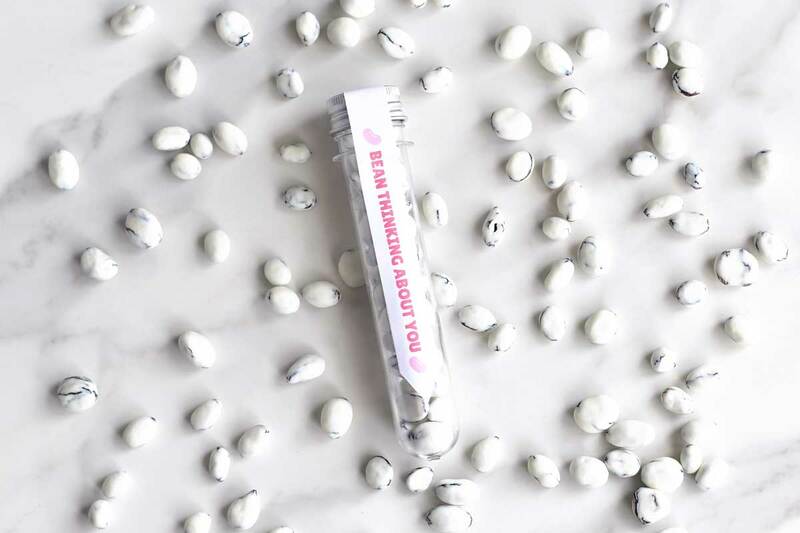 You’re Amazeballs: I made Mini Chocolate Cherry Protein Bites to fill this test tube. I’ll share the recipe ASAP and link it here. Or you can buy these Made Good Granola Minis that are nut free. Other options might be cheese balls, Cheesezit Grips, or mini pretzel balls if they can fit. Sometimes giving edible gifts isn’t an option or you just want to be more creative. 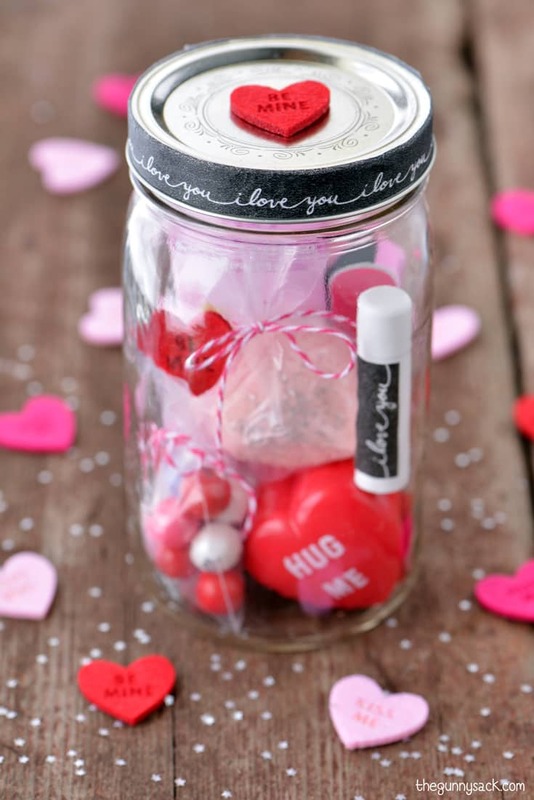 Here are several ideas for non-food Valentine’s Day test tubes. I found all of these non-food items at Dollar Tree so they are super affordable. We Sound Good Together: Wind up red, white, or pink earbuds and secure with a twist tie and stuff them into the test tube. Just make sure the earbud part fits into the test tube! 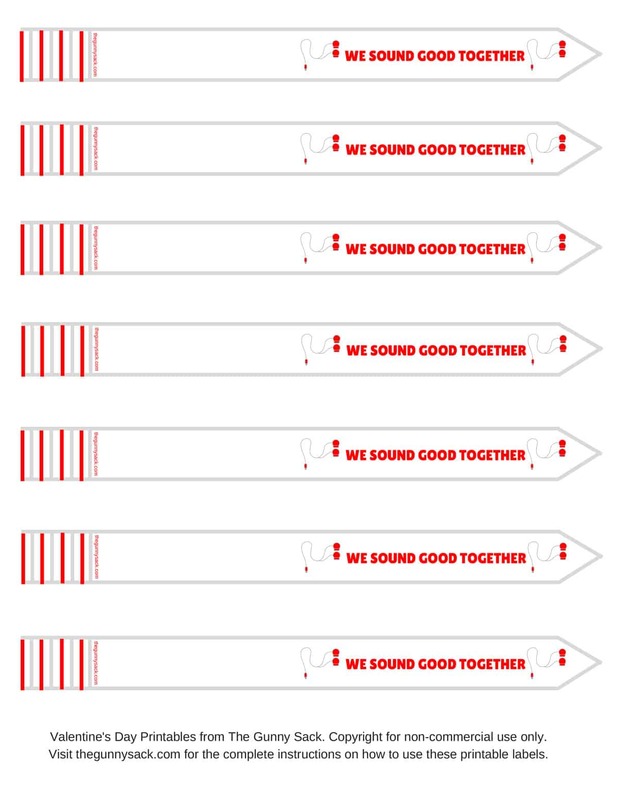 Download the We Sound Good Together printables here. 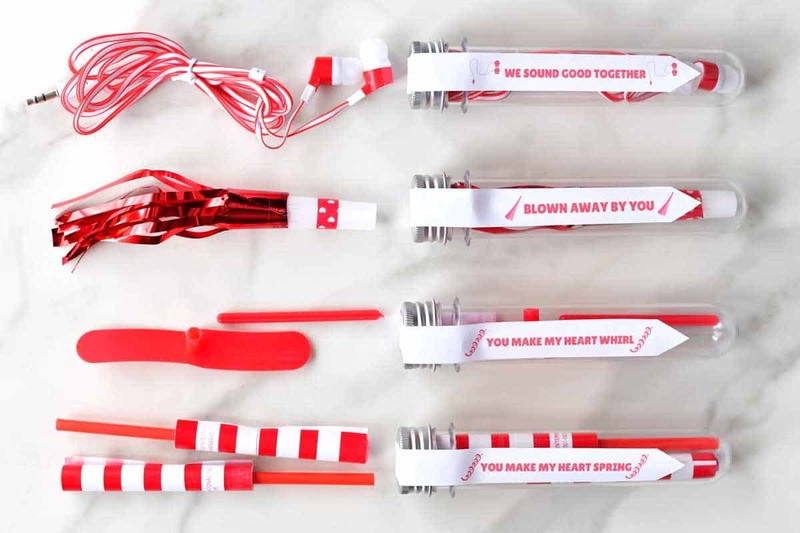 You Make My Heart Whirl: Another popular party favor are whirl-a-copters and if you take them apart, they fit easily into the test tubes. 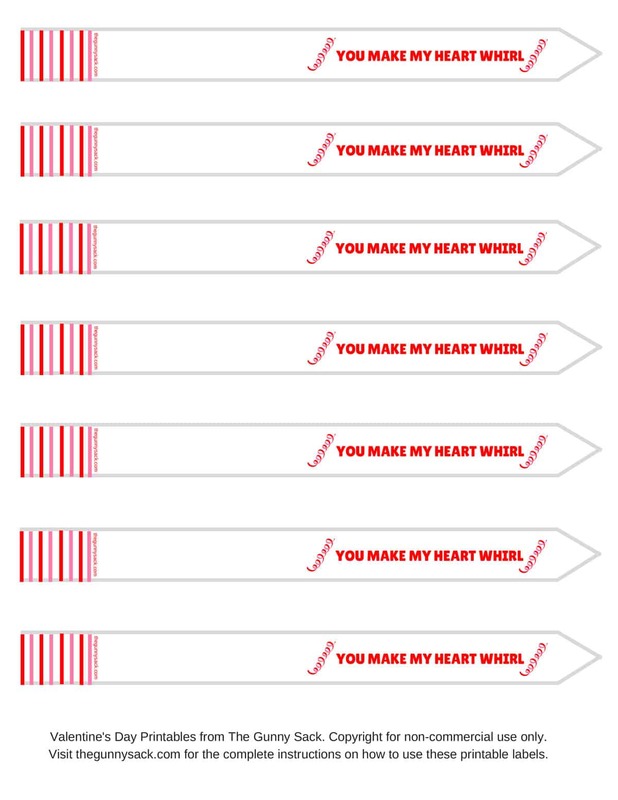 Download the You Make My Heart Whirl printables here. 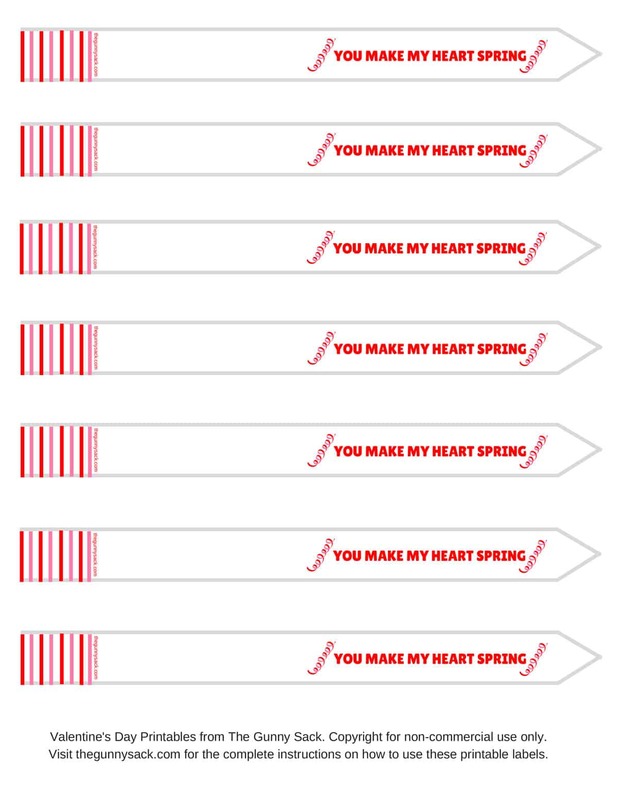 You Make My Heart Spring: To make the red and white Chinese Yo-Yos fit into the test tubes, I had to cut the plastic handle a couple of inches. Don’t worry though because it doesn’t affect the functionality of the yo-yo. Download the You Make My Heart Spring printables here. 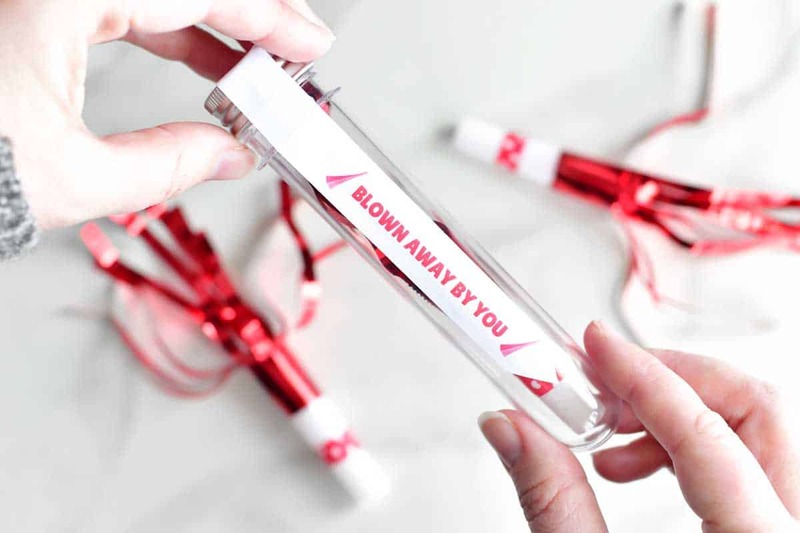 Blown Away By You: The classic party favor fringed squawkers or horns fit perfectly into the test tubes. The red, pink, and silver ones all would work well. 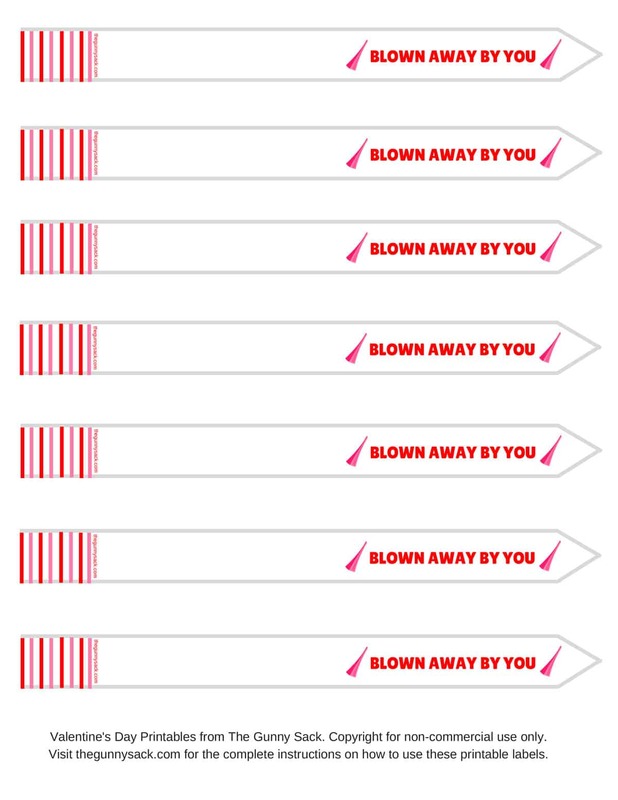 Download the Blown Away By You printables here. 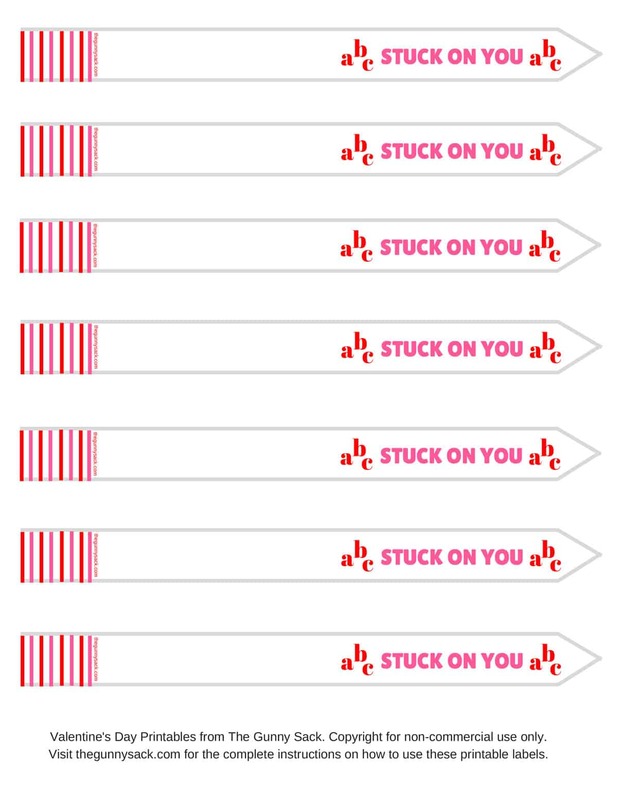 Stuck On You: Stickers are another easy Valentine’s Day treat and they are sold everywhere! Just make sure you can either cut them apart, like I did with these alphabet stickers or that they can bend to curl into the test tube. This test tube could also be filled with band-aids or sticky frogs/hands. Download the Stuck On You printables here. 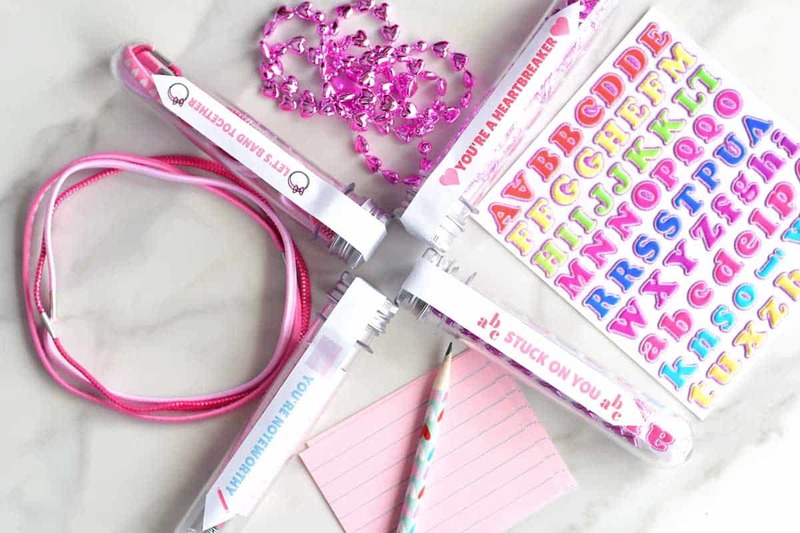 You’re Noteworthy: For this one cut pink notebook paper down to size and add a Valentine’s Day pencil. The pencil was significantly longer than the test tube so I sharpened it until it was the right size. 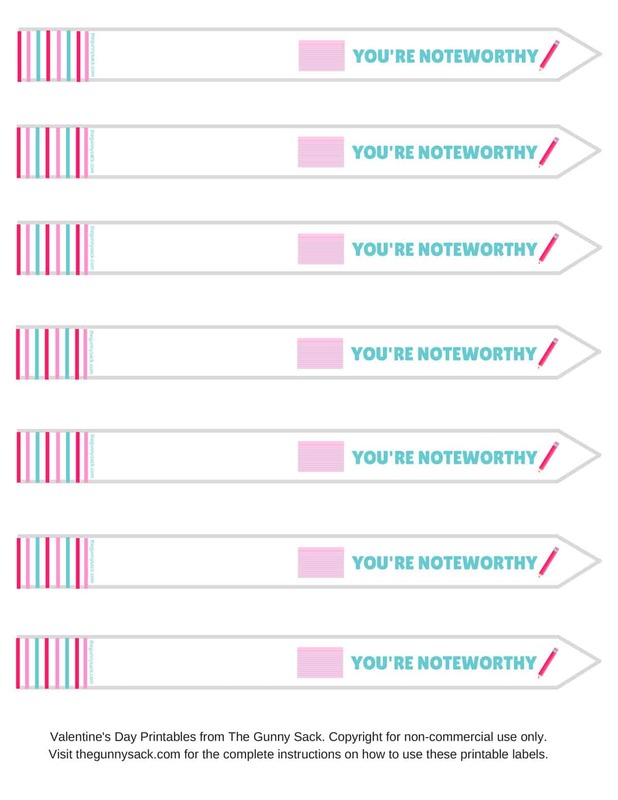 Download the You’re Noteworthy printables here. Let’s Band Together: Girls love headbands and the narrow ones fit perfectly in the test tubes. I was able to put three in one tube. 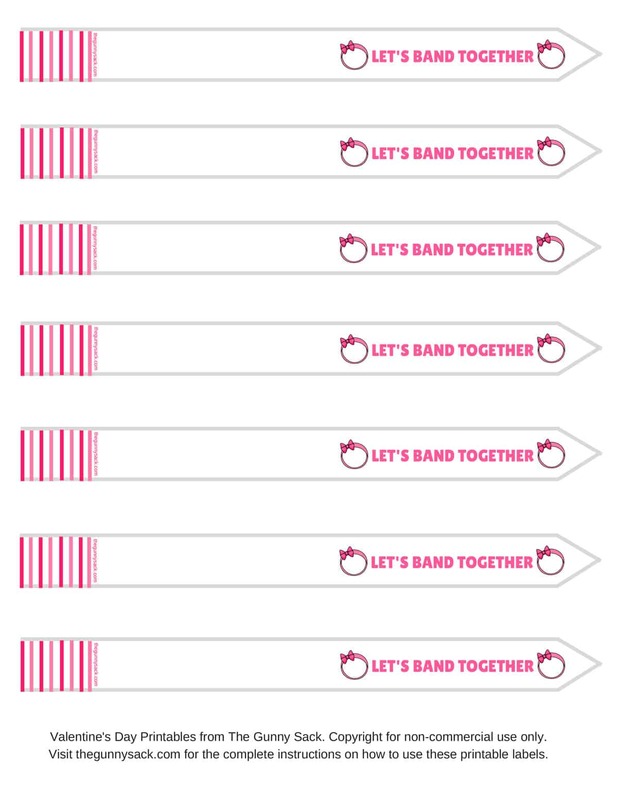 Download the Let’s Band Together printables here. You’re A Heartbreaker: These inexpensive necklaces with heart-shaped beads are sold everywhere around Valentine’s Day. You could use the red, pink, purple, or silver ones. 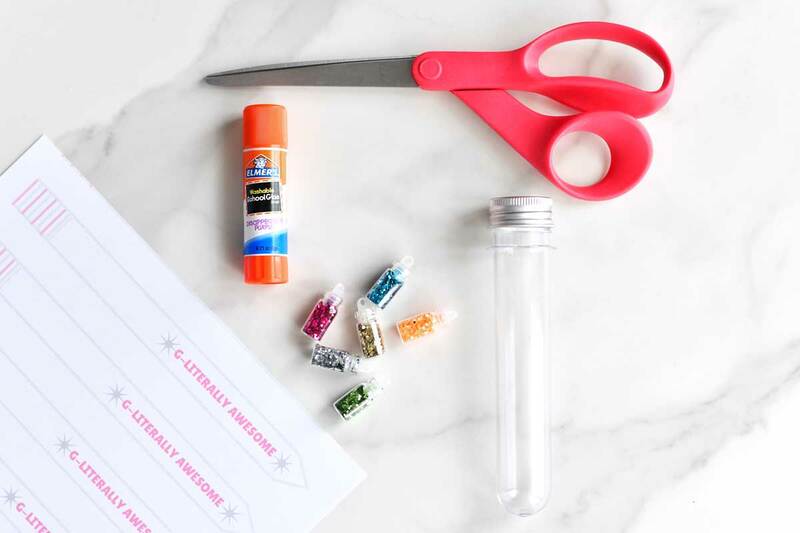 G-Literally Awesome: Aren’t these mini containers of glitter the cutest things EVER! I took them out of a nail art kit from the Dollar Tree. I threw away the glue and just used the glitter. All 6 containers fit into the test tube. 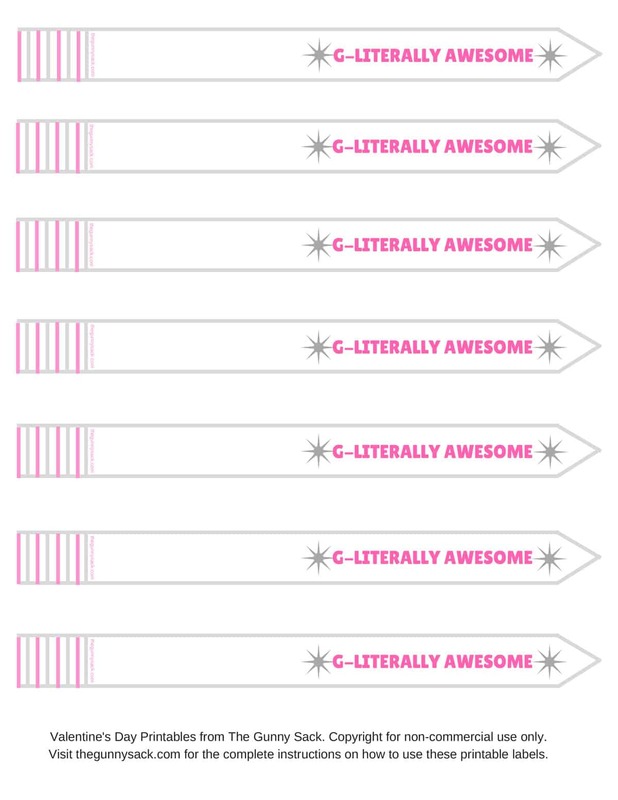 Download the G-Literally Awesome printables here. 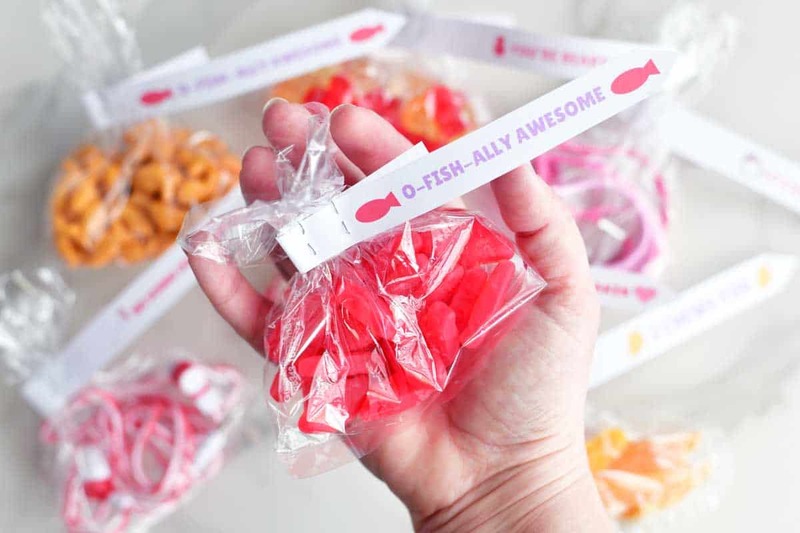 If you don’t have test tubes, you can still use these Valentine’s Day Ideas and turn them into treat bags instead! You can use the same treats and the same labels. I found a pack of 40 cellophane bags at Dollar Tree but they are available everywhere. Put the treats in the bag, twist the top shut, and staple the label in place. Where can you buy test tubes? These are the exact test tubes I bought. They are plastic and there were 30 test tubes in the package. I’ve also purchased plastic test tubes from Michaels in the past but am not sure what they currently sell. What size are the test tubes? When I measure the tube without the lid, the opening is 7/8 inch (a quarter cannot fit inside the tube) and the length is 5 1/2 inches. I can’t find test tubes. Is there an alternative? YES! 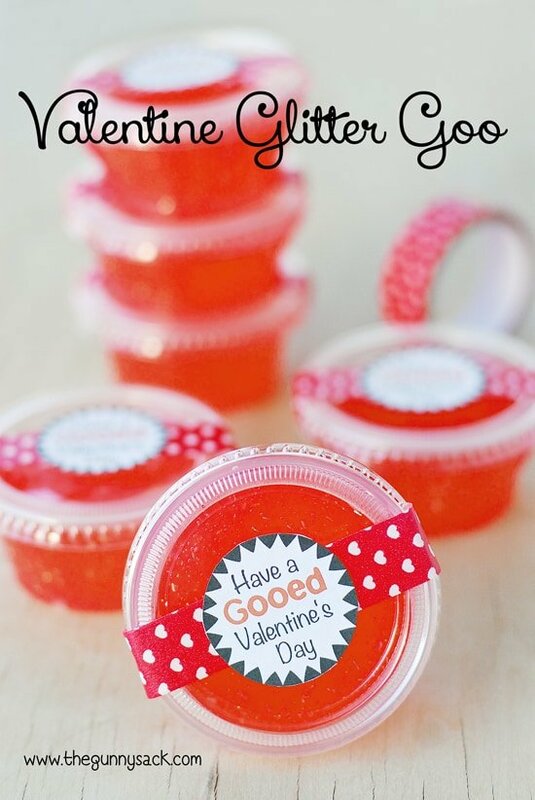 You can use the same printable labels to make Valentine’s Day treat bags. See the bottom of the post for more information on this. My test tubes are smaller than yours. Can I still use the labels? YES! When you are ready to print the labels, use the printer dialog box to scale the size of the page down by whatever percentage you need them to be. I have my own Valentine’s Day Idea. How can I make labels? 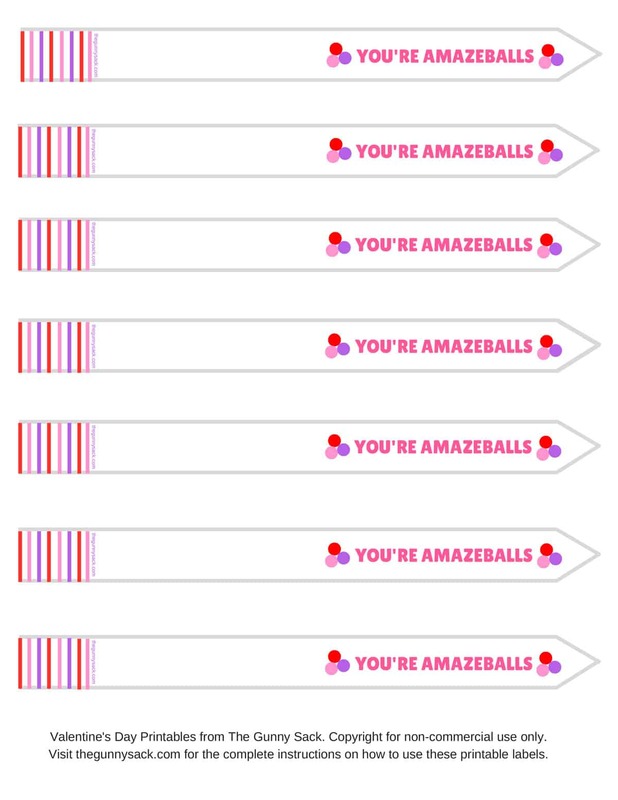 You can download a BLANK Valentine’s Day test tube label PDF (or here are the blank labels as a photo if that’s easier) for you to add your own Valentine’s Day pun. Can you design my labels for me? No. Unfortunately, I do not have the time to create individual labels for you. Can I buy Valentine’s Day test tubes from you? No. They are not for sale but I highly encourage you to try making your own. HELP! I don’t have a printer but want to make these. Here a couple of options: Make the test tubes without the labels. Or put the PDFs you downloaded from the blog post onto a flash drive and bring it to a printer like FedEx Office to have them printed. Or cut strips of paper and make handwritten labels. 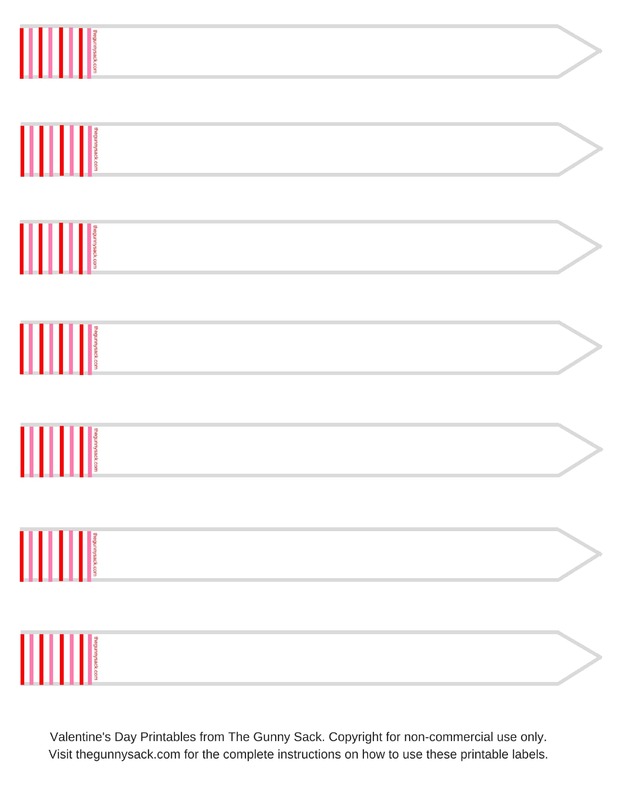 Each printable is linked below the description of the test tube. Click the link, download the PDF (do not print directly from the link) and then print from your computer. I used premium 24 lb inkjet paper. It is thicker than standard paper but not so thick that you can’t fold it over the test tube. And this is the printer I’ve been using for a few months now. So far I love the large ink tanks and haven’t run out of ink yet. Cut the labels out along the inside of the gray lines. I used a heavy application of an Elmer’s glue stick to attach the labels to the test tubes. Where can I get the test tubes ? I purchased mine on Amazon: http://amzn.to/2DxhhJp They are plastic and there were 30 test tubes in the package. When I measure the tube without the lid, the opening is 7/8 inch (a quarter cannot fit inside the tube) and the length is 5 1/2 inches. I’ve also purchased plastic test tubes from Michaels in the past but am not sure what they currently sell. 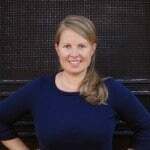 I love all these ideas Tonia! !